You know gluten-free airplane meals have really improved when all of your seatmates are envious of your meal. That’s exactly what happened on a recent flight from London Heathrow to Chicago O’Hare, when we finally got to try an American Airlines gluten-free meal. Since this was a longish (eight and a half hours) international daytime flight, we enjoyed both lunch and a savory minimeal, along with a glass or two of house wine. One of the perks of ordering a special meal is that you’re typically served before everyone else. This American Airlines gluten-free lunch arrived just as we started to hear the sounds of the dining cart and the familiar “Would you like pasta or beef?” query. Not only was this gluten-free meal noticeably healthier than the heavy pasta and gravy-covered beef standard meals, it was also genuinely tasty. The starter, a light salad, came with a basic but flavorful oil and balsamic vinegar dressing, clearly labeled with its ingredients. The bread roll (thankfully individually packaged with ingredients clearly legible) was dense and covered with flaxseed and millet, and it was a welcome alternative to the rice cakes we’ve been served so many times. The fish (cod?) was tender and flaky, steamed simply with oil and herbs. The carrots and celery were juicy and well seasoned, and the wild rice served as a nice starchy base for the meal. The fruit bowl made for a light, healthy finish to the meal. Okay, so maybe we would have preferred a chocolate or two, but eating lighter is always a good idea when flying. We often choose overnight flights when flying internationally, so we’ve come to expect the standard gluten-free airplane breakfast: yogurt and fruit. Since this was a daytime flight, though, American served us a sort of savory gluten-free minimeal. Just like lunch, this was a lighter and well-balanced meal. The chicken, carrots, and potatoes were all tender and flavorful with an herbed butter: a definite win for gluten-free airplane meals. 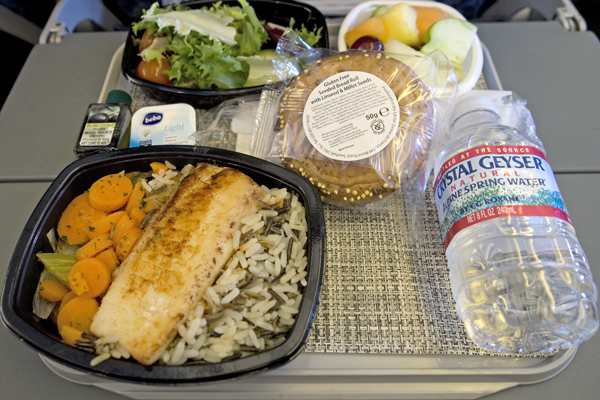 Though this was a great gluten-free airplane meal, we know it’s still not always easy to fly gluten-free. If you do choose to try a gluten-free meal when flying, the ordering process can be less than convincing, depending on your airline. Some airlines will allow you to order online or email you a confirmation. If you have to order by phone, though, we recommend calling to order your special meal three days ahead of your flight and then confirming the order two days ahead of time. Even after you’ve confirmed, of course, there’s always a possibility that your airline will neglect to fill your order. 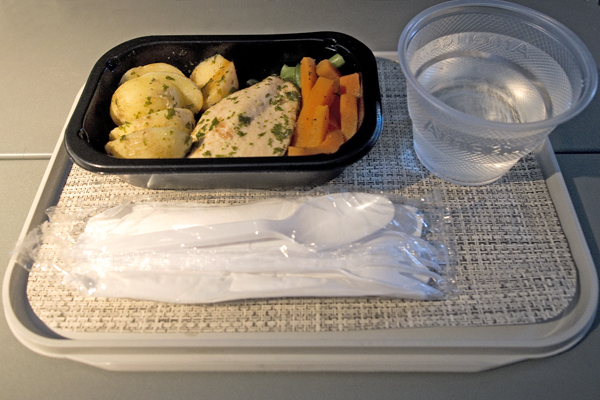 If you have multiple food intolerances, well, you may have no luck at all with airplane meals. We always recommend packing extra food and snacks to meet your needs, just in case.